Google Analytics is a powerful tool that ABC Marketing takes full advantage of when managing your SEO services. Google Analytics is a powerful tool that ABC Marketing takes full advantage of when managing your SEO services. 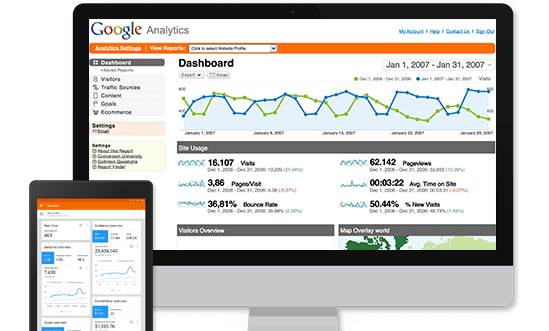 We make sure that Google Analytics is properly implemented on your site in the back end. While the tracking code wizard may work for some users, there are a number of scenarios where a more complex implementation is required. Properly tracking your marketing goals is crucial and we can configure Google Analytics to track destination URLs, leads from your contact forms and even sales with Ecommerce tracking. There's more to Google Analytics than simply running a report. Google Analytics can help provide your business with lots of ways to get answers, and we'll help you to ask the right questions. While "out of the box" reports are available through Google Analytics and are quite powerful, getting the most insightful data possible requires some expertise and ABC Marketing has the know-how to get you the best possible data to help you succeed online.